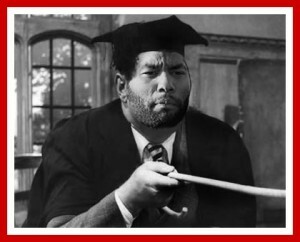 Football Burp’s very own Jermaine Pedant enjoys nothing more than strolling back and forth in his professor’s gown, casting scholarly gazes over his fellow professionals’ online scribblings. Jermaine Pedant says… You’re lucky to have been blessed with a knack for silky wing play, Robert, because if you can’t distinguish between the past indicative ‘were’ and the adverb/conjunction/noun ‘where’ then I wouldn’t much fancy your chances in most other walks of life. It is a rare occasion that yours truly is rendered speechless, I tell you. A rare occasion indeed. FAO whosoever penned the abomination above: see me. Jermaine Pedant says… …whereas I, Christopher, am shocked by your inability – or, arguably more shockingly, reluctance – to use a past participle where and when it is required. I accept that English is not your native tongue, but you are sufficiently remunerated to be privy to the very best that private tuition has to offer. As I am currently out of favour at Stoke City, may I be so bold as to offer my services? My rates are most reasonable, I assure you. @robbie9fowler I agree but to score a wembley hatrick would of been special. Jermaine Pedant says… It would have been special if you’d used the correct auxiliary verb, Adam. Furthermore, there are two t’s in ‘hattrick’ or ‘hat-trick’, howsoever you choose to write it. Personally speaking, I would accept either. Should of let him complete the hat-trick.. Poor from him. Jermaine Pedant says… Please listen to everything I say in future, rather than zone in and out. Swansea have been to good today! Jermaine Pedant says… “Swansea have been to good as Bradford have been to bad”: is that what you meant to write? If not, then I regret to inform you, young Adam, that you have been made to look foolish by perhaps the most basic homonym there is. It would be too bad if you had to stay behind for two hours’ detention on Friday, not to make too fine a point of it. Can Bradford deny Swansea space between MF/DF lines?Can Bradford get offensive set pieces regularly?Can Swansea deal with favouritism? Jermaine Pedant says… Please look up the word ‘favouritism’, Stanley. For all that you ‘talk sport’ these days, know that I will always be on hand to correct it! Great night out in Toon last night. Sunday night crakin night, plenty of luaghs !! Jermaine Pedant says… Were you by any chance out with your erstwhile Newcastle United teammate Lomana LuaLua? Or has his (admittedly fabulous) surname distorted your perception of how to spell the word ‘laugh’? It was noted on the most recent episode of the Match of the Day 2 televisual strand that you, Nolberto, are the most substituted player of the Premier League era. If I had a spare pupil waiting outside, I should be beckoning him over right now with a circular rotation of my index fingers. Jermaine Pedant says… You were at Real Sociedad for two years and you didn’t learn how to spell their name correctly? Why does Batman and Superman always show Mercy to Joker and Luther? For Them to Get Back out and kill again and again! Jermaine Pedant says… My question is this: why do Batman and Superman constitute a singularity in your mind? If they fought crime together and named their holding company Batman and Superman, you would be correct – this is however not the case, and you must therefore be subjected to my own inimitable brand of justice: namely, two hours’ detention after school on Friday! Grammar aside, you raise a good point. Perhaps we may discuss it on Friday. Jermaine Pedant says… See me. Now I must take my leave, for Mr Pulis appears to remain nonplussed by my attempts at reconciliation. A nice pair of cufflinks should do the trick, I’ll wager. Class dismissed! Tune in every Wednesday for more from Football Burp’s very own Jermaine Pedant! Football Tweets of the Weekend: Kamara, Davids, Wright, Hartson, Neville and several others!